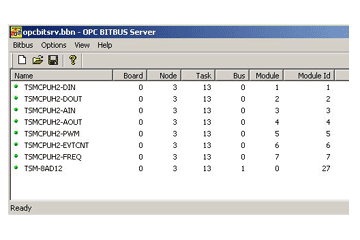 The OPC Standard (OLE for Process Control) allows an uniform access from Windows® programms (visualization, reporting and control applications) to any process data at a or even at several field busses. Manufacturers of control equipment and measuring devices offer an OPC server and manufacturers of e.g. visualization tools OPC clients. Our server only works with slave-hardware from our company. The communiction is based on OLE-technology for network component modelling DCOM. OPC servers present data as data items to the network so they can be accessed by all computers on the network. Objects usually are seperate outputs (Valves, motors, relays) or inputs (temperature sensors, proximity sensors).They can also represent variables of a control circuit or a status word, that summarizes the status of a complete system. The OPC-Server allows the OPC-Client to define groups and variables and to refresh those cyclically.